1. The patient must be an active participant. “Doctor” means teacher; it is up to the doctor or any healing practitioner to help educate the patient, in order that the patient can make the decisions regarding their treatment. Today health is more of a consumer product. The patient and/ or the insurance company pay for a commodity, namely health repairs, which are to be supplied with very little input from the patient. 2. Treatment should above all, do no harm. Much of orthodox medical/dental treatment neglects this very important tenet, either by dispensing toxic drugs on a chronic basis, or by implanting toxins in the mouth. Often more harm is done than if nothing had been undertaken. Natural therapies attempt to rid the body of toxic substances and assist the body in healing. 3. The body has a natural, innate desire to be in a state of homeostasis. The chronic use of drugs suppresses symptoms and does not act curatively. Natural therapies do not work o this suppressive level, but rather gently push and assist the body towards homeostasis. 4. A person is more than a physical being. He or she is more than can be measured by our inventions, which are extensions of our five senses- for example a microscope. A person is a spiritual, electro-dynamic, energetic, psychological being, who thinks and feels. 5. Disease is not a name; it is also not something localized which can therefore just be cut out, i.e. a cancer of the breast. The cancer which is localized to a portion of the breast is a disease of the entire person. It is a degradation of the entire immune system, or possibly a hyper functioning of the entire immune system. It involves not just some localized tissue, but rather the entire being, especially at the “other body” level. 6. Diet is what’s eaten; nutrition is what’s effective. To e effective, food must be in a form which is vibrant. It must be full of energy, and not dead. 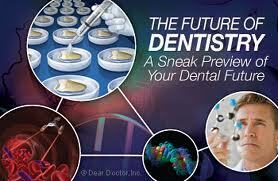 The future of medicine and dentistry is exciting. The use of a device like the Star Trek Tricorder for diagnosis is on the near horizon, and one can envision the day when disease will be remedied by exposure to different vibratory waves, audible and non-audible. Imagine placing a metal implant in the mouth, and altering its electromagnetic frequency so that it can exist harmoniously within your energy field. You have a dead tooth? NO problem, exposure to another specific frequency will impart a new vibrational pattern, so that it does not interfere with the meridian it is on. That is the future of dentistry.